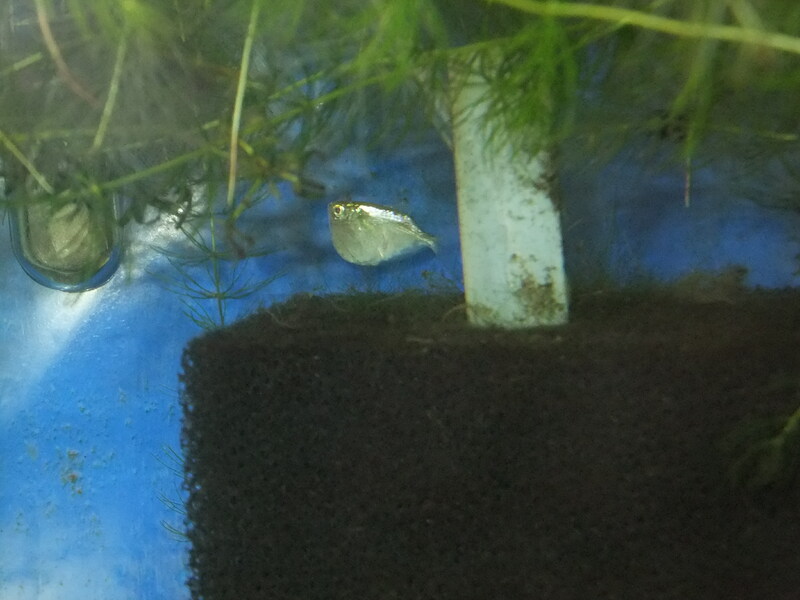 I just bought 2 Silver Hatchetfish. I have never owned Hatchets before. They seem very nervous, even though I have plenty of plants in the tank and a few small peaceful fish. If these two do well I hope to get more. These two meanies are still living together in relative peace. A blurry tank of action. Zebra Danios, Harlequin Rasboras, Odessa Barbs, Tiger Barbs and an Opaline Gourami. They are fun to watch at feeding time. 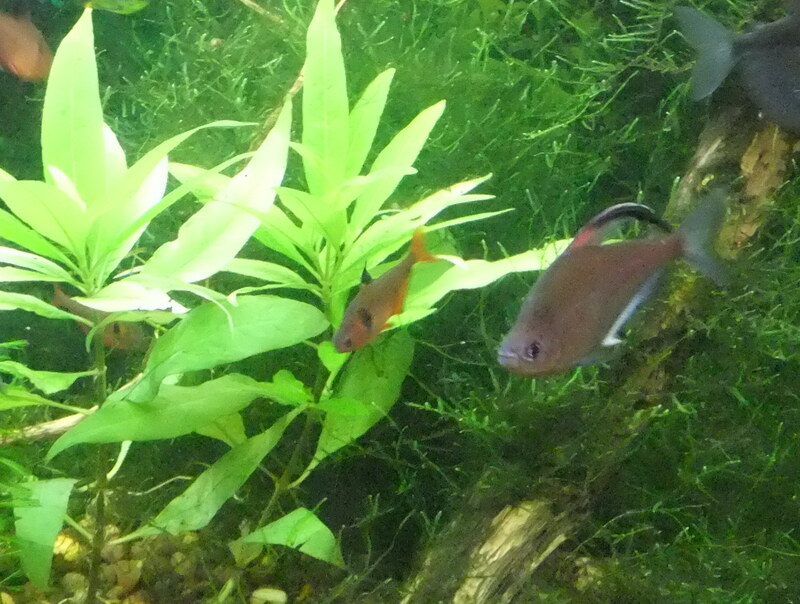 Here’s another reminder that Bleeding Heart Tetras get pretty large. 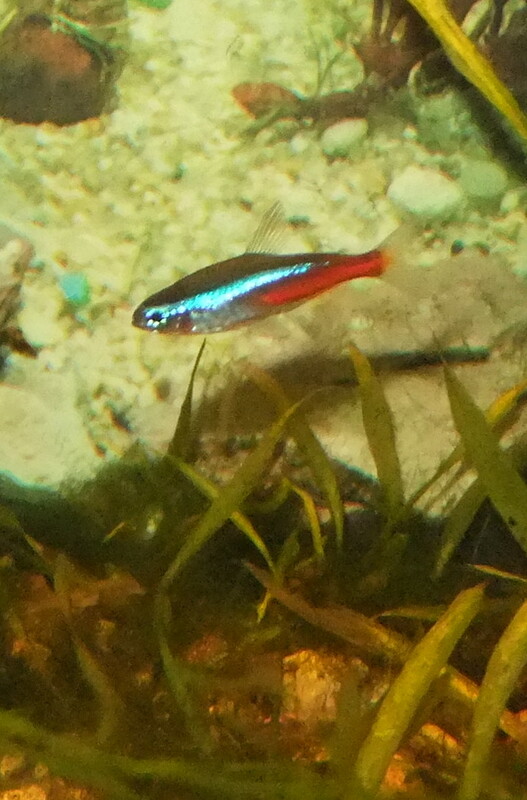 Compare this one to the Serpae Tetra. 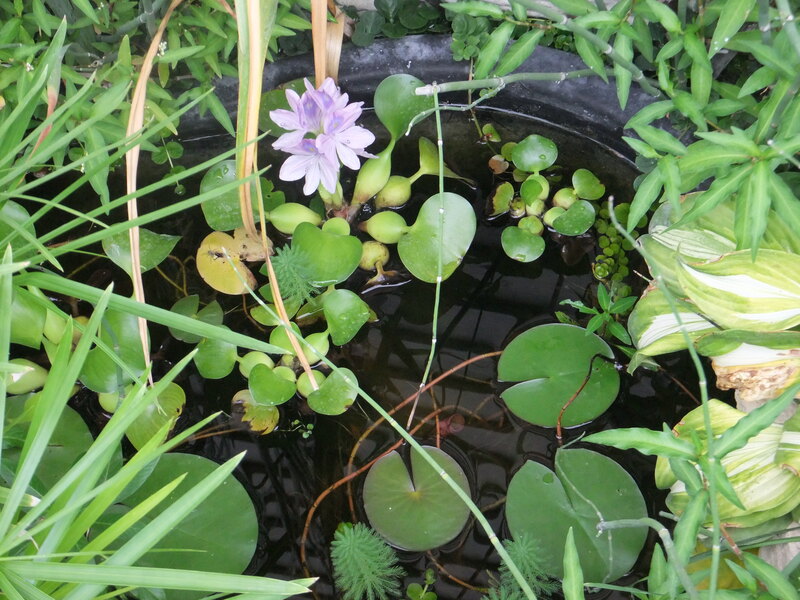 Water plant blooming in the little pond. 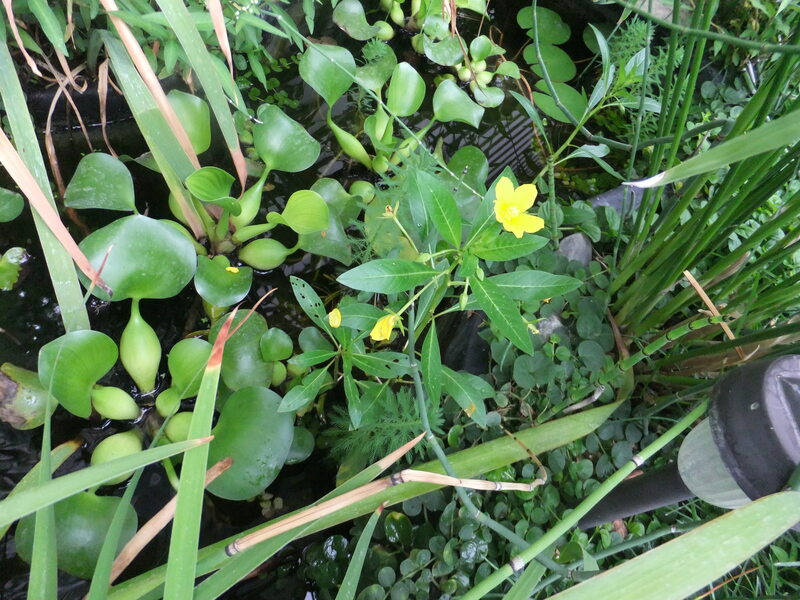 Creeping Primrose Willow, I think. 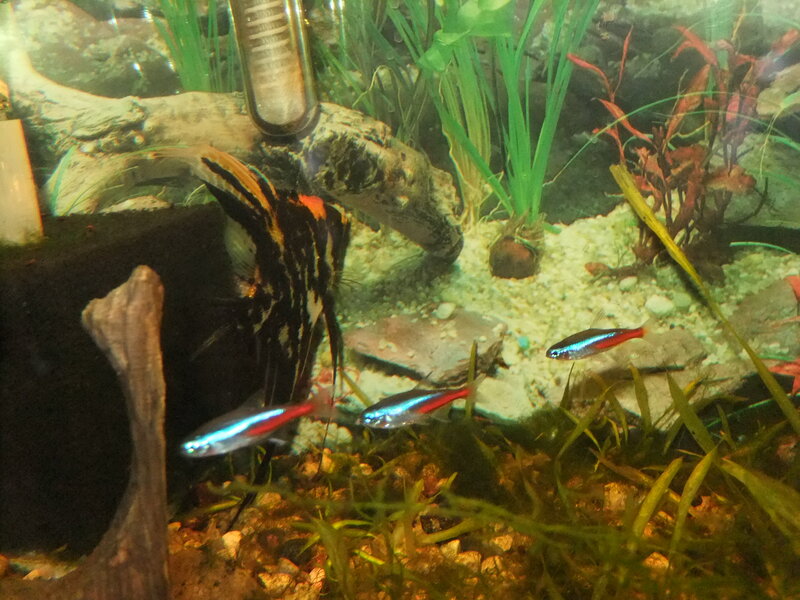 Neon Tetras and a Marble Angel. 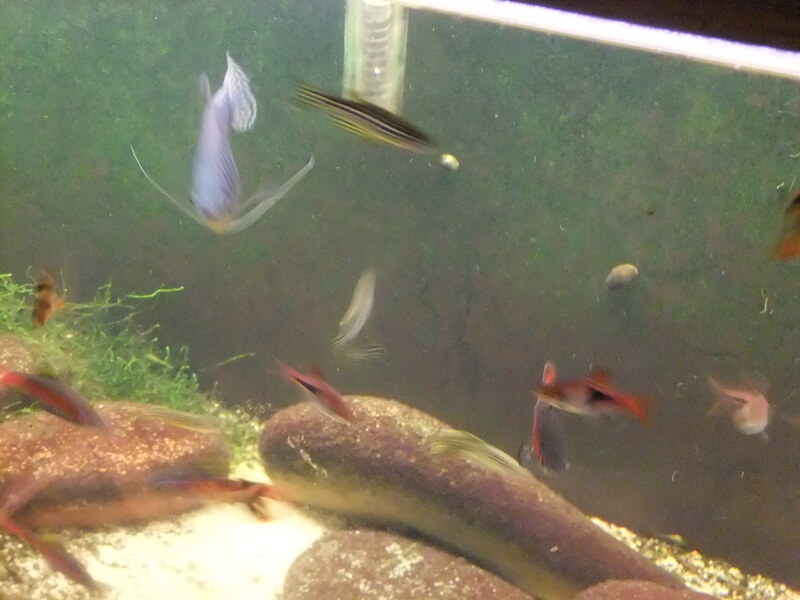 Sometimes I will take a picture of a bunch of blurry fish. One or two will actually be in focus. I will crop the picture and save it, like this one, and give the illusion that I know how to photograph a fish. Over a year ago a friend was getting rid of his aquariums and supplies. The price was right. I delivered an assortment of beers to him and I got the tanks and supplies. One minor catch was that I needed to take his final remaining fish, a killer African Cichlid. It is a male of the species Metriaclima estherae, the Red Zebra Cichlid, although you can see this guy is not red at all. This is one tough fish! 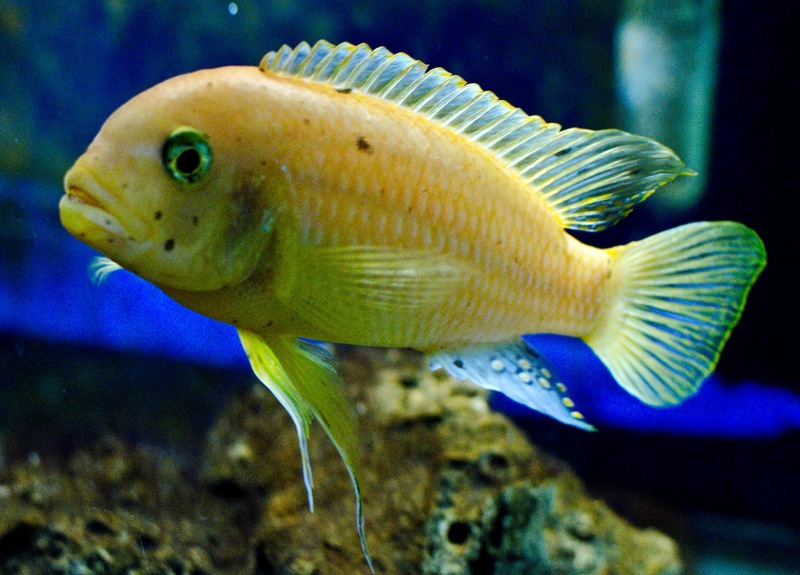 I didn’t have an African Cichlid tank set up, although I used to raise Electric Yellow Cichlids. I also tried to find this mean fellow a home, to no avail, so I put him in his own 20 gallon tank. I added gravel and rocks, some Java Moss and Hornwort, and he thrived. After Mr. Red Zebra lived alone for a year there came a time when I needed to put my angry Red-tail Shark somewhere. I decided to take a chance and I put those two together. They tangled with each other for a few weeks and now they co-exist relatively peacefully…two unlikely neighbors. To get them to live together I had to get past that first few days where the Big Bad African Cichlid was the king of the tank. I re-arranged the rocks in the tank. 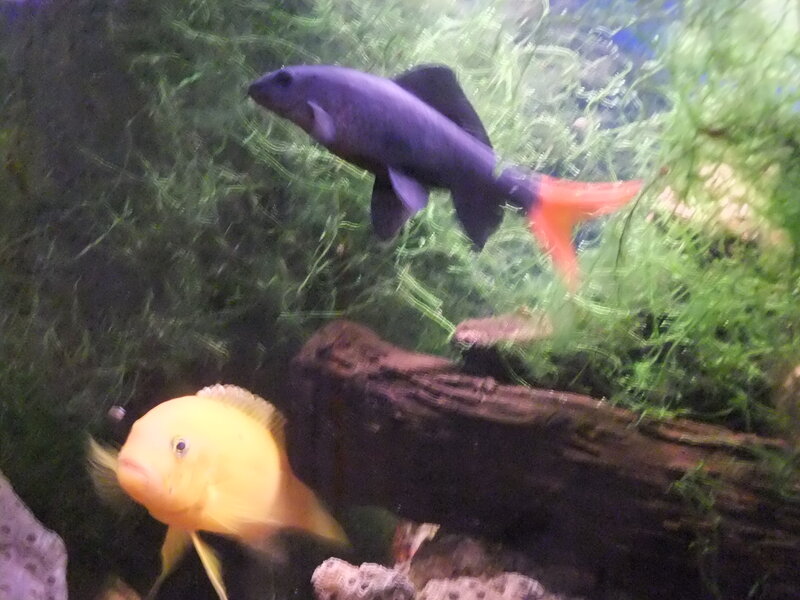 The African Cichlid was used to a certain arrangement. Moving the rocks made him less confident that he “owned” this tank. I added a group of Rosy-Red Minnows, a feeder fish. I put in about a dozen of various sizes and this gave the Cichlid something to chase…and eat. The Red-tail Shark did get scraped up a bit avoiding the mean Cichlid, but now they get along fine. No, they aren’t really in love but they do tolerate each other. They are so cute aren’t they? Jet-black body and bright red tail. They are mostly vegetarians but they LOVE frozen brine shrimp. So how can they be a problem? I will tell you. As they get older, which means after a year or so when they are over 3 inches long, they may get mean and territorial. Something triggers them to chase other fish and the Red-tail Shark is relentless. They are slashers, and they are fast. Mine seems to pick on fish that have his similar body shape, about 4 inches long and stream-lined. Not every Red-tail acts like this but remember you are taking a chance with them. 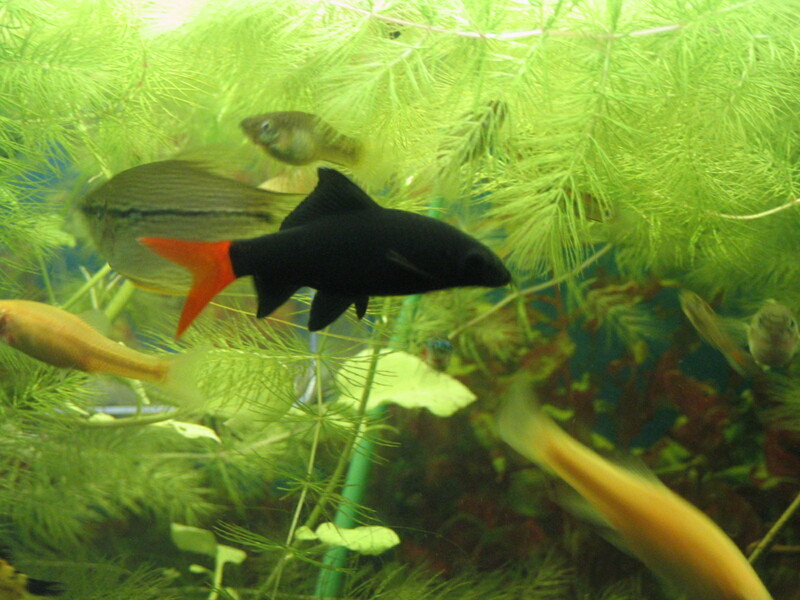 One answer is to keep them with small fish, under 2 inches, like Serpae Tetras, common guppies and platies. These smaller fish don’t seem to rouse the Shark’s aggression. A different approach is to put the adult Shark with fish that won’t take his abuse, like some of the medium-sized Cichlids. With Red-tail Sharks anything can happen, total peace or total war. Be prepared to move him out or back to the pet shop when he gets older. My Red-tail Shark is no longer in this community tank, he is a bad boy. Or girl.